Heavenly LED EMERGENCY LIGHTING AND EXIT SIGNS Compact 2 Sided Exit Sign LED Battery Back-Up - Red or Geen are Ideal for use in offices, schools and warehouses. Provides 90 minutes of battery back-up lighting during power failure. Impact resistant, injection molded white thermoplastic ABS housing is flame retardant and resists dirt, dust and moisture. Universal mounting plate for easy installation. Includes a maintenance free Ni-Cd battery with LED indicator, push test switch and 120/277 dual voltage input. Listed for use in damp locations. Exit Sign features 6"H polycarbonate EXIT sign in Red. 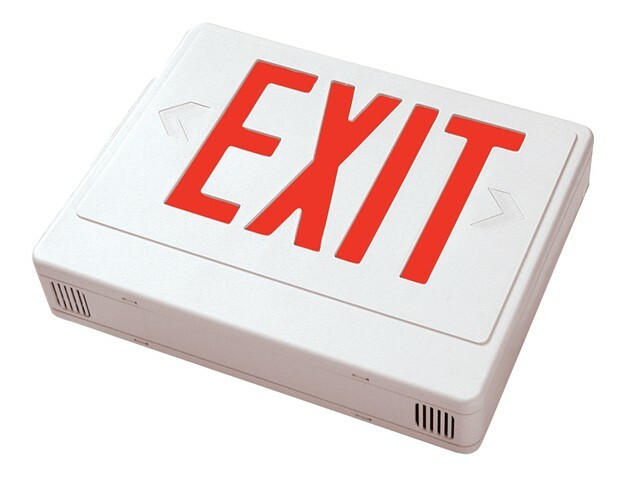 This exit sign can be used as single faced or double faced and mounted on the back, end or top. 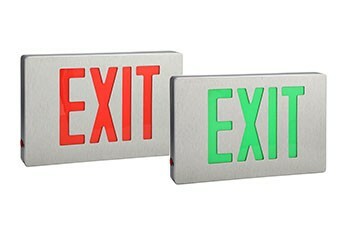 Exit sign uses replaceable directional chevron inserts on sides. Exit sign uses an LED lamp with an average life of up to 25 years.